First Saturday of March every year Deepam turns another year old. 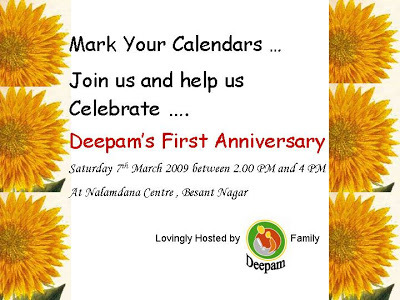 This year its on Saturday 7th March 2009 that Deepam celebrates its First Anniversary.Its been a roller coaster year- our first year with loads of activities that have kept us busy on all the weekends.Deepam from a 20 member group has more than 200 members on facebook today.New programs have been launched, New centers have been approached and courses have been launched there , reach to several underprivileged students across Chennai city , computer and other resources have been provided to the centers, new activities, additions to curriculum etc etc .All this has been possible only bcos of the dedication and commitment of volunteers off-line and on field.Thank you all for your support! So “BE THERE” on the 7th March between 2.00 PM and 4PM to witness the Annual Function of Deepam at Nalamdana Centre, Besant Nagar.Meet all our students from different centers, interact with them, perform with them and take home a bunch of good memories and smile that will last for a long time.Guests are welcome. The Talent Show on sunday at Pudiyador saw the children bring out the dancer/singer/actor in them. The winners are the eight children who presented the tamil skit on “Smoke is our enemy” with so much enthusiasm and involvement. All the volunteers were amazed by this. These kids 7-12 years old didn’t forget the sequence or lines and kept us all rivetted for a good 15 mins. The Girls who did the kolattam were the runners-up, awarded for their co-ordination and execution of the dance. Everybody’s a singer at Pudiyador! All the children wanted to sing for us. We were entertained with classical and desiya-geetham songs. Gymnastics- The boys bent over backwards to show their talent. They also formed a human pyramid! And they did some pretty good crumpin dance moves. Special Mention to Dilip who swirled the “kambu” so fast, it couldn’t be captured on camera! He also did a head-stand making it look so easy. That afternoon at Pudiyador will remain unforgettable for all who were there. Photos courtesy: Noopuran Sivaguru. Thanks Noopuran. The answer to such similar questions as above unfolded at the Deepam Annual Quiz 2009 that was organized by the volunteers at Nalamdana and Olcott High school this week. The quiz had several general knowledge rounds, audio rounds and visual rounds, We had rounds on Indian Epics, On Indian Monuments, Musical Instruments, Famous Personalities etc The kids were eager to know their question and answer them and win more points than others. A big thanks to Anupama, Shwetha, Pramod, Karthik and Moorthy for having helped us with the questions and organizing the various rounds and making them simple yet interesting. Our Quiz masters, scorers and volunteers at both the centers’ again deserve a huge round of applause for making it another success story. The Irony : The ultimate winners were TEAM A in both the centers’. Special prizes wIll be given to them on the final day of anniversary celebrations on 7th March 2009. If you wish to sponsor this event or any other event do contact us. Deepam regulars Anupama , Anbu and Archana will be on air ( Chennai Live 104.8FM ) between 12 and 1 pm, today. Tune in, to know about their experience with the kids. Collaborative Painting- How ideas were spread colorfully on 5 mt of Canvas? The team showed two different seasons Chennai ‘s hot summer and the cool rainy season. The kids came up with specific landmarks in Chennai like the local bus stops, Murugan Idly Kadai, Olcott School, Besant Nagar Beach ,St Thomas Mount and to also highlighted the presence and untiy of people belonging to all religion, caste and creed. The kids completed the painting by leaving their handprints on the canvas which was my personal favorite part of the whole painting as it showed how such small hands together completed this large canvas. 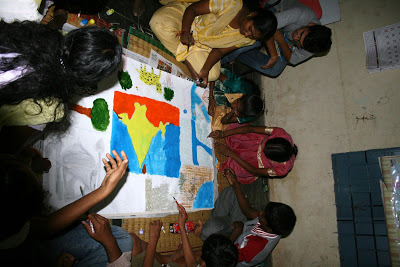 The team spent considerable amount of time to decide on what they would represent.Then one of the kids gave the newly constructed Khatipara junction as a landmark which became the crux of the painting. On one side of there was a group making the beach , and others were busy making temples, airport ,Chennai railways and the local Koyambedu Bus Junction.By drawing schools and factories they showed how Chennai has been developing and has become a hub in the southern India. One of my favorite was the Zebra crossing the kids drew – which we the volunteers couldn’t think of. The team started by drawing a huge map of India and scared the other team which hadn’t still finalized on what they would draw. They had Taj Mahal on one side ( I have visited this place more than twice and yet cant draw it anywhere close to how these kids have drawn) and the national bird and animal on the other side. 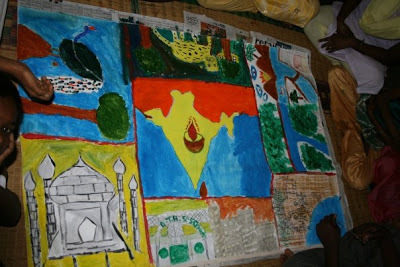 One the other half of the canvas- the kids had shown how the country has developed from villages to some big cities, IT industry, schools, factories et all. My personal favorite was the whole theme of how they tried to pull in a story of a huge country through such colorful pictures and in just an hours time. Team D was led by Anupama at Pudiyathor and supported by Noopuran. The team had several ideas pouring in but also faced a starting problem on how and what to start first.Then finally it was decided that they will show their love for the country with a big heart that connects every other picture about it. They tried to show northern India by drawing a Taj Mahal (The kid who did this needs a big applause- beautiful pencil work with nice shading) southern India with the besant Nagr beach and the Pudiyathor Community, western India through the gateway of India and the Rajastan Pot Balancing Act, eastern India though the dense forests and also drew the national bird and the animal. 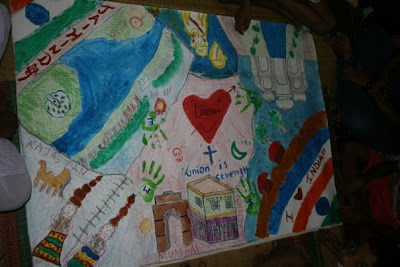 They completed the canvas by drawing the signs of all the religions and saying “Unity is Strength”- This was my personal favorite. Finally a wonderful weekend wherein we learnt how each kid thinks differently and worked together as a group and did their best. The competitive spirit helped them try to out-do the others by “Thinking Differently and Doing Differently “ There were brush strokes, finger prints, oil pastels, pencil shading, hand prints et all. Each and every kid- no matter which class they studies in participated and there was not a single kid whose idea was not considered by the others in the group. Everyone worked as a group and the end result showed on the canvas. One more thing worth noticing was that how these kids looked at the positive side of life. Though they have not been as lucky as many of us in getting our daily needs and living in comfort they presented a very colorful picture of their city and country. None thought of the poverty, traffic, anti social activities or even the slums across India….Hats off to the future leaders of our country. Their dreams seem very positive! Pictures Courtesy:KK (Karthikeyan) who was the official photographer on both the days. To participate and fund for the Deepam activities and more importantly “HELP THEM DREAM” join us ! 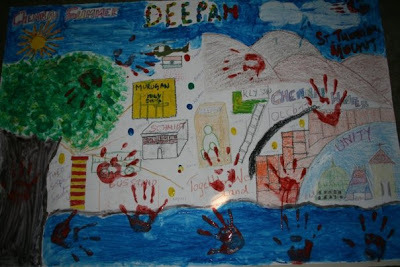 Deepam 1st Anniversary celebrations kicked off with a ‘Collaborative Painting Workshop’ on Saturday and Sunday. Students at 3 of our centres – Olcott School , Pudiyathor and Besant Nagar Community center had a lot of fun splashing the colors on the canvas. Over 40 students participated in this activity. The kids enjoyed themselves immensely – their creativity and team work was on display as they turned the blank canvas into a piece of art . 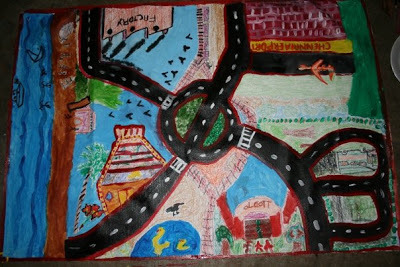 A big thanks to Archana and Balaji – They helped take this concept from an ‘Idea on Paper’ to ‘Painting on Canvas’ !! They planned this event well, from buying the right materials / coming up with a ‘workable theme’ to coordinating with the other volunteers and kids, to ensure the event was a success. Thanks to all the volunteers, who worked along with the kids , got their hands dirty with the paint and brought shape to the painting.